I find myself at Bar Britanico a lot lately and blogging about its occasional celebrity clientele or El Hipopotamo across the street. But I’ve realized from Google that many people still find my June 2006 posting about the closing of Bar Britanico, which I forgot to update to reflect the re-opening of Britanico….oops. …A late afternoon photo taken from the window of Bar Britanico, looking out on the intersection of Brasil and Defensa streets. Another for the City that Fades Away series…. 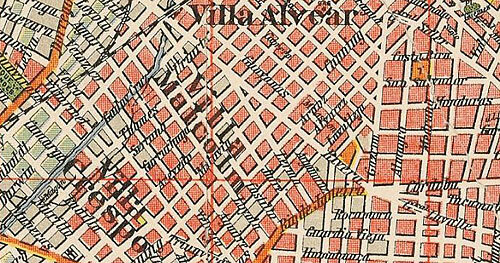 The basta de demoler blog chronicles the demolition of the historic architecture in Buenos Aires. Their posts this last week have been about the illegal demolition of yet another aspect of the city’s cultural heritage, the former Hotel Metropol (Bartolomé Mitre 1618/20). You should take a look at this video that offers a tour of the interior. Chad W. Post of the Three Percent blog, an excellent source of information on literature in translation, is in Buenos Aires for the annual book fair and a meeting of foreign editors. Our schedule is packed”“starting tomorrow morning at 9:30, we have meetings from 10am till 7pm (or later) every day of the week. And no scheduled tango dancing”“all literary meetings. You can follow his updates. As someone with Irish ancestry (way, way back), I’ve written a bit before about Irish immigration to Argentina. A great resource for this topic is the wonderful Irish Migration Studies in Latin America (IMSLA). As the articles in this journal demonstrate, the contribution of the Irish and subsequently Irish-Argentines to the sporting landscape was varied and wide-ranging. Many Irish people who worked for British-owned railways or businesses were either co-founders or members of the first sports institutions, initially cricket clubs and later football and rugby clubs. Even if you don’t have a strong interest in sports, there are a lot of fascinating historical insights about Buenos Aires and Argentina in these well-researched articles. Who are the legendary figures of Buenos Aires? Obviously, Eva Peron is the most known (along with hubby Juan). Among those who read, Borges is legendary. Among those who dance tango, there’s Gardel. Buenos Aires has great old architecture but are any of the architects of Buenos Aires really legendary, the likes of Louis Sullivan or Gaudí? He could not be Sullivan, he could not be Gaudí. Well, perhaps Gaudí, who lived to that old age which is sainthood, an ascetic old age, frail, slight, wandering the streets of Barcelona, unknown to its many inhabitants. In the end he was struck by a streetcar and left unattended. In the bareness and odor of the charity ward amid the children and poor relations a single eccentric life was ending, a life that was more clamorous than the sea, an everlasting life, a life which was easy to abandon since it was only a husk; it had already metamorphosed, escaped into buildings, cathedrals, legend. What do you write about when you don’t know what to write? Or, when you’re filled with thoughts, each competing for attention, seeking expression? I find myself falling back into reading about my favorite historical period, 1880 – 1930. The architecture of Buenos Aires is a vivid reminder of that age, but I’m more and more intrigued by another topic: criminality and mental illness in Buenos Aires, circa 1900. My reading list includes learning much more about José Ingenieros, one of the leading Argentine criminal psychiatrists, and his mentor José María Ramos Mejia. Along the way I need to re-read a lot of Horacio Quiroga, who did a very good job in his fiction of identifying with the mad. 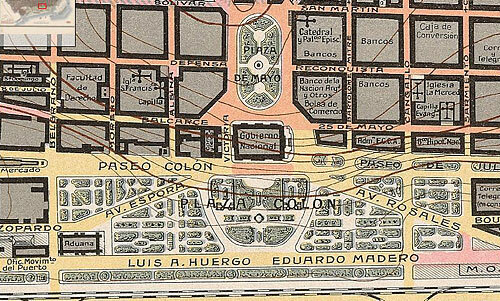 So, over the next few months will be the occasional post about the psychopathology of Buenos Aires a century ago. Meanwhile, here’s a photo of a somewhat smoky Parque Lezama. I wish I could draw, but I can’t. If I could draw, then I would spend a lot of time drawing the architecture of Buenos Aires. I wish that Buenos Aires had such a nicely produced set of books about this city’s architecture. But for those who like architectural drawings: out at the School of Architecture, Design, & Urbanism (FADU) of the University of Buenos Aires hangs a set of lovely drawings of some of the best architecture in Buenos Aires. I spend a lot of my time in Buenos Aires scratching marks on paper…some of it comes out like this. I’ve been neglecting this blog for most of March while I was busy with other projects. But now it’s time to resume regular postings.